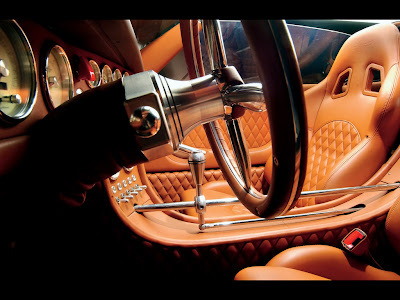 Mechanic Girls: Super Cool Supercars ! 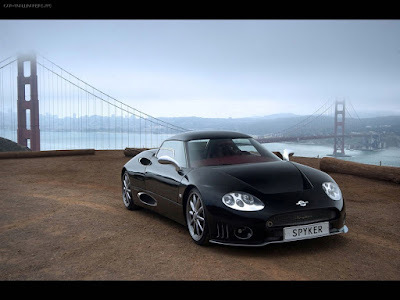 Showcasing Spyker Supercars pictures and videos. 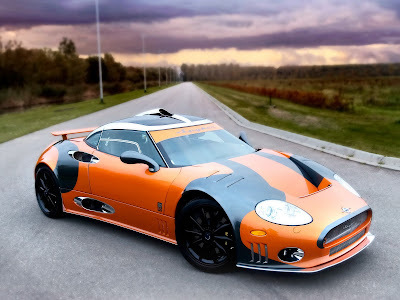 You all know supercar names like Ferrari, Bugatti and Lamborghini, but there are all kinds of boutique automakers producing small numbers of outrageously expensive and stunningly quick cars, and Spyker has to be one of the coolest. 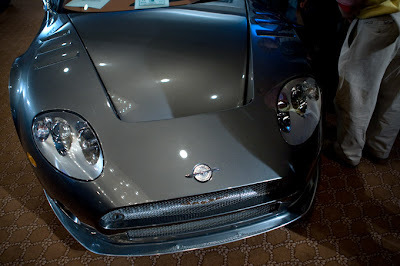 The Dutch company has been building sports cars at a rate of about 60 per year since 2000, but its history dates to 1875 when it started making coaches — horse-drawn coaches. 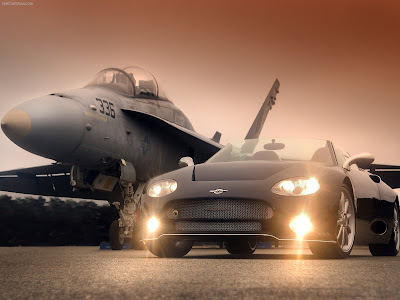 It switched to automobiles in 1898 and turned out airplanes during World War I. Spyker folded in 1925 and was little more than an automotive footnote until the late 1990s, when Dutch lawyer Victor Muller resurrected the name. 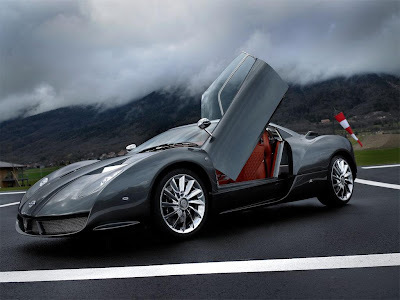 The design of the Spyder SWB (which stands for short wheelbase and is such a mouthful that the car will henceforth be called the Spyder) draws from the company’s aviation heritage. 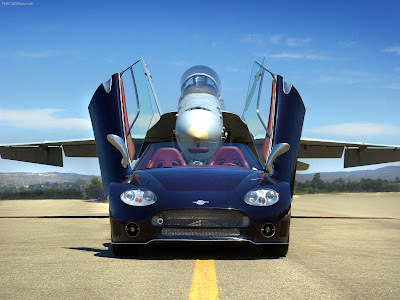 People will either love the styling or hate it. 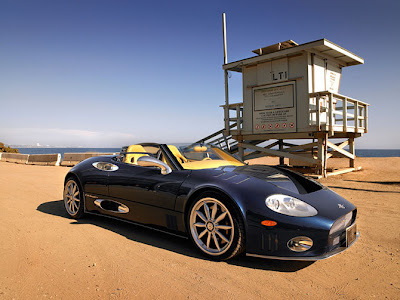 Yet the Spyder is more subdued than the C8 Aileron hardtop, which has more scoops than Baskin-Robbins. 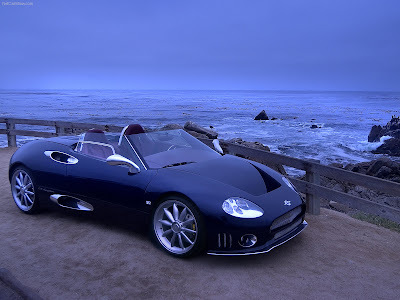 Spykers have excellent proportions and a beautiful silhouette, though some might think the Spyder looks a bit like a catfish from the front. 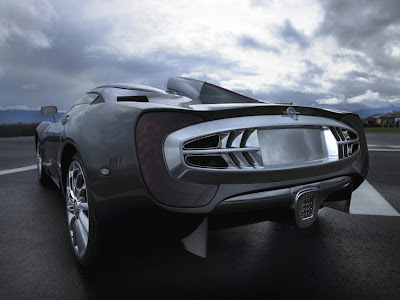 Power comes from a 400 horsepower 4.2-liter V8 engine. 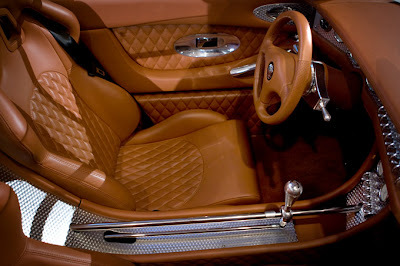 It is mounted in the middle of the car, where it belongs, and mated to a six-speed manual with a beautiful exposed shift linkage (shown above). A very burly security guard with no sense of humor prevented us from seeing how the shifter action feels. The turned aluminum panels, machined switches and polished metal give the interior an industrial chic that borders on steampunk. 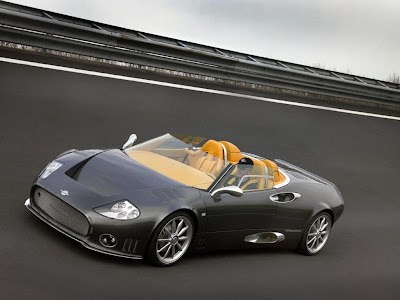 Anyone wealthy enough to buy a Spyker — the Spyder starts well north of $200,000 — can pretty much choose their own paint and interior colors. Some models come with an optional set of Louis Vuitton luggage because you wouldn’t want your bags clashing with your car. That’s Latin. 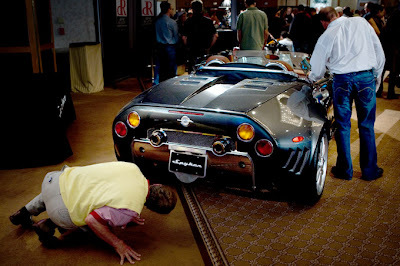 It means “For the tenacious, no road is impassable.” It has been Spyker’s motto since 1914. 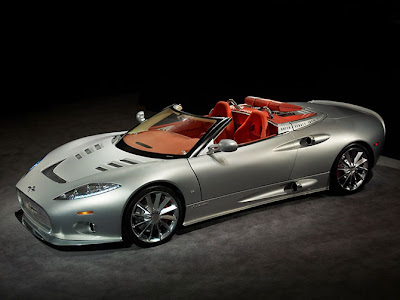 The Spyder accelerates from zero to 60 in 4.5 seconds and has a top speed of 187 mph. 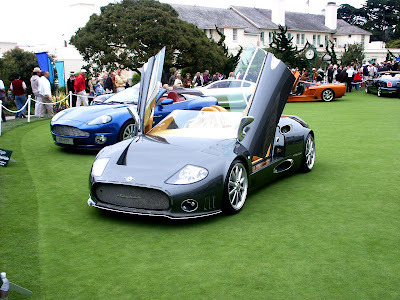 We’ll have to take Spyker’s word on that, because no one was willing to give us the keys so we could see how it handles the winding roads around Monterey. 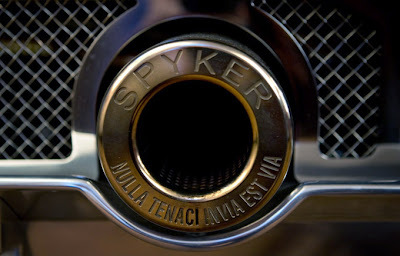 In keeping with Spyker’s aviation heritage - the company built about 100 fighter planes and 200 aircraft engines during World War I - its logo incorporates a propeller and a wheel. 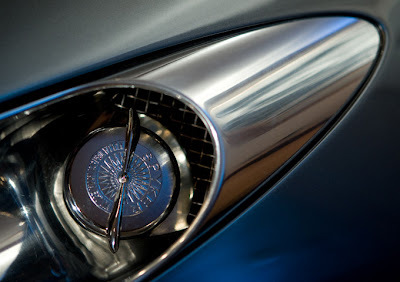 It appears on the hood, the rear deck and on what has to be the coolest gas cap ever.